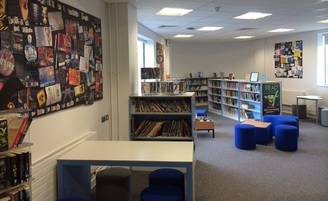 The Hans Price LRC is a vibrant and welcoming space designed to engage students in reading for pleasure and to provide a supportive environment to allow students to work independently and achieve their academic potential. On this site you can find a range of information about the LRC and the resources it has to offer. The site is still under construction and will continue to grow. All ideas about how to make it better are very welcome! The LRC is open before the first learning session in the mornings and after the academy day has finished. It is open throughout the day including break and lunch times. You can buy all the equipment you need for school in the LRC. Pens, pencils and rubbers start at 5p each. Students are encouraged to make the most of the resources available to them in the Learning Resource Centre, these include over 20,000 books, magazines, newspapers, DVDs and online resources. The LRC has seating areas for quiet reading and study and computers for students to use for research, classwork and homework. We are currently increasing our available online resources and we are are constantly updating and expanding our range of fiction, non-fiction, magazines and DVDs. All students are automatically set up with a LRC account and are welcome to borrow up to two books at once. They can keep these books for up to two weeks and have the option to renew them for a further two weeks. DVDs can be borrowed on a one day loan. Students can also borrow eBooks and audio books from our online library. We have a wide variety of reference material and magazines that can be used within the LRC. There is an expanding further education and careers section where you can browse through prospectuses, career information and job descriptions. Our magazine selection includes BBC History, BBC Wildlife, Delicious food magazine, Empire, Evo car magazine, BBC Music, Focus science and technology magazine, Four Four Two football magazine (and other sports magazines), Geographical, FlipSide, ASOS fashion magazine, Top Gear, Girl Talk, Mega, Wired, Hello and The Simpsons. We also have an interactive 'talking' globe. By touching the wireless pen to the globe, control panel or book you can learn about different countries, population, languages spoken, national government, currency, land area, cities, music, history, life expectancy, geology, climate and ecology. You can compare distances between two place, population, areas of countries and life expectancy between countries. If you want a challenge to can race against the clock to find continents, countries, cities and waterways or take the multiple choice trivia quiz. The globe also comes with a World Discovery Book that includes even more information on maps, world flags, landmarks, animals, dinosaurs, foods, explorers, moon maps, sky maps, and more!